Description: Ascending annuals to 45 cm high, glabrous. Leaves cauline, to 7 cm long, 1–2-pinnatisect with 7–10 linear-subulate or oblanceolate lobes to 35 mm long, lobes entire or pinnatisect. Heads c. 4 mm diam. 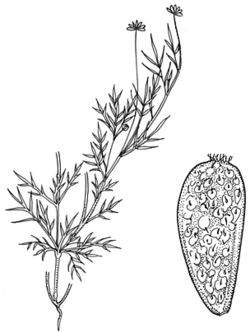 ; peduncle naked, 4–14 cm long; involucral bracts obtuse with minutely ciliate margins. Ray florets mauve, pink or white; ligule 7–10 mm long. Achenes cuneate, swollen but slightly flattened, 1.9–2.4 mm long, brown to black, margins narrow, smooth; faces tuberculate, each tubercle surmounted by a minute bifid hair; pappus c. 0.1 mm long of spreading bristles. Distribution and occurrence: Grows in sclerophyll forest or grassland; widespread.